Tis the season for simple meals with bold flavors! I love this dinner because it’s perfect for a warm evening with a few cold beers and a good dinner date. I made a simple compound butter with some miso and lemon and it paired wonderfully with the steaks and garlic scapes. Our garlic scape season is winding down as we prepare to pull full stalks out of the ground next week! One thing I love about hard neck garlic is that it’s the gift that keeps on giving. Between the scapes, fresh garlic and cured garlic, I love every stage of its life cycle! Aside from preparing the compound butter (which is extremely simple) this meal can be on the table in less than 15 minutes. I’d recommend making a double batch of the butter and freezing it because it will come in handy all summer long and pairs well with a variety of grilled meats and veggies. I think it would also be awesome to stir into some savory oatmeal with a fried egg and scallions for a simple breakfast. In fact I may play around with that and report back with a recipe if it turns out. Stay tuned! Thank you to everyone who reviewed my cookbook on Amazon. It takes a village and I’m thankful to you all! Prepare the miso butter by combining all the ingredients in a food processor and processing until smooth. Taste for seasonings and adjust as needed. Transfer the butter to a piece of parchment paper or plastic wrap. Form the butter into a log and wrap it well. Chill for two hours before cutting into pieces and serving. One hour before you plan on eating remove the steaks from the refrigerator. Generously season them with salt and pepper and keep them on a plate until ready to grill. Heat an outdoor grill to medium-high and oil the grates. Toss the garlic scapes with a little olive oil and season with salt and pepper. Place the steaks and garlic scapes directly on the grill and close the lid. Grill the garlic scapes for about 3 minutes per side (or until lightly charred and crisp) and the steaks for about 4-5 minutes per side (for medium rare) or until desired doneness. 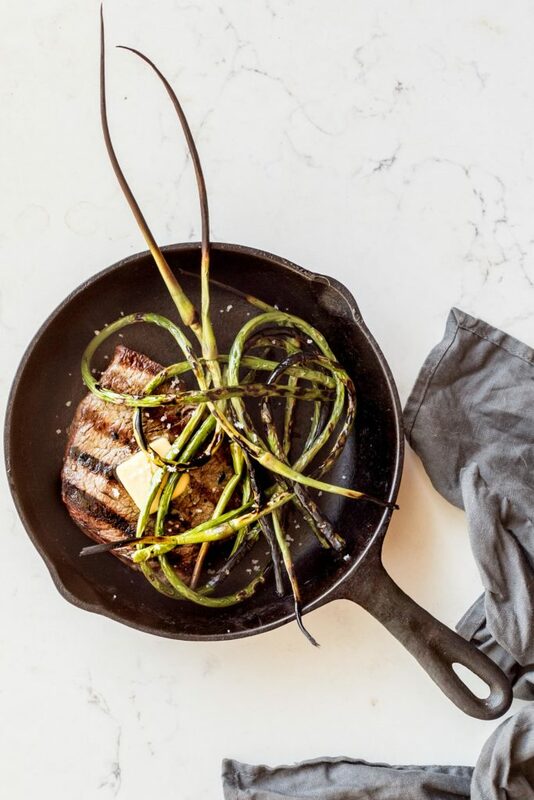 Serve the steaks and garlic scapes with the miso butter and enjoy. This is perfect for my meat-loving father! Thanks for this recipe, Andrea ! !